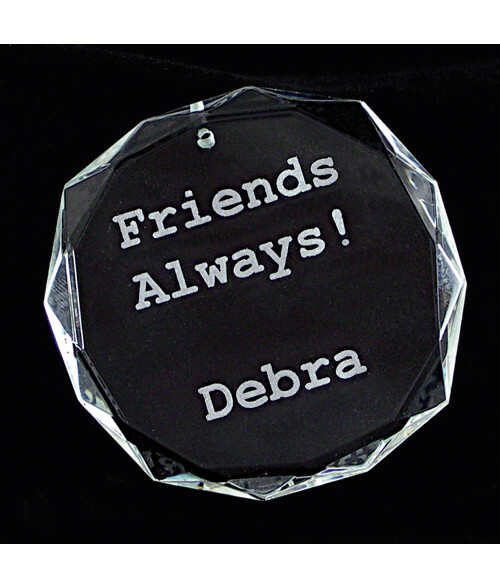 The highly polished Round Facet Ornament is a beautiful way to preserve sentiments, yearly milestones and memories. Each Ornament is packaged with a silver ribbon and arrives in a beautiful satin-lined gift box, completing the luxury of this gift. (1) 3/4" x 6" & (1) 1" x 6"
(1) 3/4" x 6-5/16" & (1) 15/16" x 10-1/4"
(1) 3/4" x 6-11/16" & (1) 1-1/16" x 11-1/4"
(1) 3/4" x 6-1/4" & (1) 1" x 10-1/4"
1-7/8" x 3-7/8" x 2-1/4"
10-5/8" x 7-5/16" x 1-3/4"
2-7/8" x 2-7/8" x 3-13/16"
3.9" x 3.9" x 17"
6" x 4-3/8" x 2-5/8"
6-1/4" x 5-3/4" x 2"
6-3/4" x 1-1/2" x 1-1/16"
6-3/4" x 2-7/8" x 1-1/4"
7-3/4" x 2-1/4" x 2"